Moisture can seep into your basement at the vulnerable place where the wall meets the floor, known in the construction industry as the cove joint. Water collecting in the area beneath the structure of your home can cause serious damage. 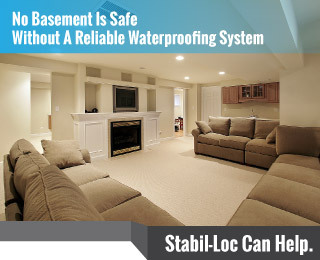 To fix the problems related to basement water seepage, your local Stabil-Loc professionals will install our popula waterproofing system, which seals the basement from the inside out. On the exterior of your home’s foundation, a waterproof membrane should be installed along the foundation wall to stop moisture from entering your basement. This type of water-resistant membrane is the perfect solution if the basement wall is damaged. The membrane will guide the moisture into a sump pump which will guide the water a safe distance from your home. Our friendly and helpful team of experts can help you reduce the stress and anxiety of ongoing foundation problems with prompt, professional estimates and repair services. Call us today to schedule an appointment. For your safety and peace of mind, everything our Authorized Stabil-Loc Dealers do is licensed, insured and guaranteed.